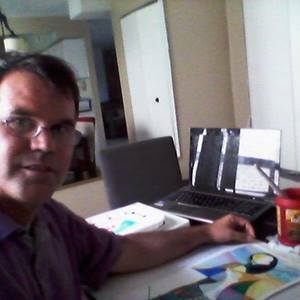 David Ralph, founder and owner of the imaging and conceptual company Marco Image & Concept, is a contemporary artist and illustrator who lives in Greenbelt, Maryland, USA. About ten years ago, David had a vision to create a series of abstract watercolor paintings that explored the female figure through curve, line, and a composition of varying shapes of color, value, and pattern. This exploration led to a distinctive style that has shaped David’s unique brand of painting and illustration since. David's story began back when he was a toddler of five or six years old. As a child, he filled many sheets of paper with drawings in pencil and magic marker. Professional sports figures and animals were his favorite subjects. Thumbing through nature and sports books, he soon filled sheets of paper with pictures of sharks, rattlesnakes, birds, tigers and the popular star athletes and sport franchises of the day. When he reached the age of seven, David rendered his first portrait of Roberto Clemente, a baseball player with the Pittsburgh Pirates. This drawing, which was framed and placed on top of a bookcase shelf in his home, began the regular acknowledgment of seeing his drawings on the walls outside his classrooms and in his home. In trying to describe and categorize his style of art, David Ralph has coined the term “Geoformism”. According to David, Geoformism is defined as a style of contemporary abstract art that focuses on the form of a subject (or object) and its underlying geometric essence. It contains elements of both geometric abstraction and figurative realism. Today, David continues to create abstract compositions of the female figure as well as other themes of interest such as nature, music, people and sports.